The ceasefire between Israel and Gaza has been extended for five days as of Wednesday, August 13. The remaining issues for negotiations include the lifting of the blockade on Gaza as demanded by Hamas and the demilitarization of the Gaza Strip, which is what Israel wants. The UN Human Rights Commission has also announced who will participate in the investigation of war crimes committed during Operation Protective Edge. And Israeli officials have already criticized the inquiry, saying the outcome is predetermined and biased against Israel. The deadline for the report is March 2015. During that assault, more than 60 Israelis died, mostly soldiers, and more than 1,900 Palestinians died, who were mostly civilians. Now joining us from Turkey is Richard Falk. He joins us via phone. Richard is a professor emeritus of international law at Princeton University, and in 2008 the United Nations Human Rights Council appointed Richard to a six-year term as a UN special rapporteur on Palestinian human rights. Thank you for joining us, Richard. RICHARD FALK, PROF. EMERITUS INT’L LAW, PRINCETON UNIV. : I’m glad to be with you, Jessica. DESVARIEUX: So, Richard, let’s you get your take on the latest news regarding the ceasefire extension. How durable does the ceasefire look? And does a long-term ceasefire seem sustainable? FALK: Well, I think it’s hard to imagine a long-term ceasefire without some kind of movement toward a long-term territorial solution. It’s one thing to lift the blockade, which certainly should be done and will create a temporary sense of relative normalcy in Gaza, which is in desperate humanitarian straits at the moment, not only because of the attack of the last few weeks, but even before that, because it was blockaded. The tunnels had been destroyed by Egypt, which it had relied upon since 2007 to get many of the basic necessities of life. And so the situation of Gaza has to be addressed in a more fundamental way than a demilitarization versus blockade. And demilitarization is a tricky move to expect Hamas to make, because it in effect makes Gaza totally vulnerable to whatever Israel decides to do. It’s always been somewhat vulnerable. But if they really do agree to demilitarization, whatever that actually means, it would totally make it appear that Hamas had surrendered its capacity to resist what it regards to be an unlawful unlawful and unjust occupation. DESVARIEUX: Now, the negotiations are taking place in Cairo. And I wanted to get your perspective on what Egypt’s role is in all this, and also other Gulf states and other players in the region. Do you think that they could play a more positive role during these negotiations? FALK: Well, it’s rather surprising that Egypt is playing any role at the moment, because it has been very hostile to Hamas ever since the Egyptian coup back in the middle of 2013. Before that, the Egyptians could play an intermediary role, which they did in the last major Israeli attack, which was in November 2012. But now Egypt is very closely aligned to the U.S., seems to have encouraged Israel to attack Gaza, because it too was deeply opposed to Hamas, which it regards, rather misleadingly, as an extension of the Muslim Brotherhood, which the Sisi government in Egypt has criminalized and has been responsible for a very bloody crackdown. More possible as real political agents of some kind of conflict resolution process are Turkey and Qatar, both of whom have tried to exercise some kind of diplomatic initiative which responds to the humanitarian crisis that is afflicting Gaza, but it also is opposing Israel’s disproportionate and probably illegal initiation of this whole round of violence. DESVARIEUX: Let’s turn and talk–. Sorry, Richard. Continue. What were you saying? FALK: Well, I was just going to say that it’s a very strange situation that’s emerged in the region, because Saudi Arabia, which is a strongly fundamentalist Islamic government, also gave Israel a green light to attack Gaza, because it’s more fearful of the Muslim Brotherhood and Hamas than it is of Israel and what Israel represents, that it has opposed over the years. There’s a new sectarian dimension of regional politics that is quite confusing, because it has two levels. One level is the two types of Islam, Sunni Islam, which is represented by the Saudi Arabian and Egyptian societies, and Shiite Islam, which is associated primarily with Iran. And then you have the second level, which is the fear of the monarchies, particularly in the Gulf, of any kind of grassroots political Islam. And that’s with the Muslim Brotherhood is. It’s not a movement that is associated with a state. It’s a movement that’s associated with the general population. So it’s a bottom-up challenge to authoritarian rule that was present particularly in Egypt during the Mubarak era. So what Saudi Arabia portrays and symbolizes is this extreme anxiety about any democratizing movement by the people, even if it has a strong Islamic character and it prefers an authoritarian leader like Mubarak or Sisi to the possibility of the sort of democratically elected leader that Egypt had during the year that Mohamed Morsi was in power. DESVARIEUX: But with this sort of democratic identity that you mentioned the Muslim Brotherhood having and sort of an offshoot Hamas has as well, there’s also this identity that at least in the United States is constantly perpetuated of them being a terrorist organization. So can you more or less give us the facts here, Richard? How would you identify Hamas in all this? FALK: Yes, that’s a very important and, in my view, confusing understanding of both the Muslim Brotherhood and Hamas. Muslim Brotherhood decades ago renounced violence as a tactic. And although they’ve been called a terrorist organization by the Egyptian military, and particularly by General Sisi since he has taken control in the middle of 2013, there’s no real substantive foundation for calling the Egyptian Muslim Brotherhood a violent organization, much less a terrorist organization. They’ve been brutally repressed, and in retaliation it’s possible that they have engaged in some violent acts, but they are definitely committed to a nonviolent political strategy. They were elected in five successive elections in Egypt, both to the parliament and to the presidency. Hamas, which emerged as a resistance movement in the West Bank and Gaza, particularly Gaza after the ’67 War, did engage in terrorist activities up to about 2006. It was responsible for suicide bombings and the like. But since 2006, when it was encouraged by the U.S. to participate in elections in Gaza, it’s adopted essentially a political strategy. But it had the misfortune to win those elections, which wasn’t expected, in Gaza, and since then has been categorized as a terrorist organization, subject to the blockade, subject to the loss of foreign economic assistance, which Gaza really depends upon, and has been punished, even though, as I say, it sent numerous signals that it would respect a long-term ceasefire, that if the blockade were lifted and if Israel were to retreat to the 1967 borders, it would accept a 50 year coexistence framework, peaceful coexistence. 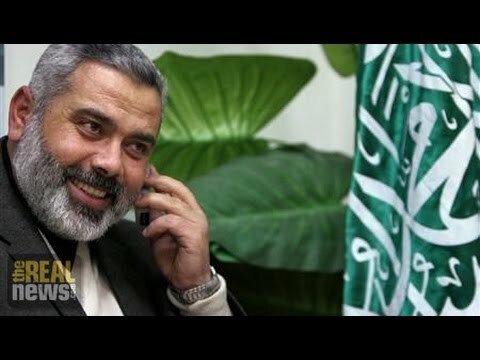 When Hamas came into power in Gaza, the prime minister, Haniyeh, sent a confidential message to George W. Bush while he was president saying there’s too much violence in the region, we want to end the chaos, and we’re ready to enter into this long-term political accommodation, which implicitly acknowledged the validity of Israel’s existence. That message and other efforts to signal the same intention was never responded to, and there was in fact an attempt to overthrow the Hamas governing authority in Gaza by relying on some parts of a very extremist part of the Fatah PLO organization. So the reality is that there was a real opportunity to find an accommodation with Hamas that could have avoided this tragic sequence of events that have evolved since 2006. And we should know from the experience with South Africa and with Northern Ireland that if you want to make peace with a resistance movement, you have to begin by treating them as a political actor, particularly when, as is the case with Hamas, they signal that intention. I’ve had conversations with two leaders of Hamas, Khaled Mashal and Marzouq, both of whom in separate conversations reinforced this conception that’s so contrary to what the media portrays, which is this desire to work out some kind of sustainable peace with Israel. And it may not be their real motives, but it’s been a tragic mistake, in my view, not to explore whether this kind of diplomacy would have led to a stabilization and normalization, and eventually to some kind of secure peace. DESVARIEUX: Yeah. Alright. Richard, just really quickly, final question. I wanted to ask you about this recent news that came out today. The White House instructed the Pentagon to put a shipment of Hellfire missiles to Israel on hold. Do you see this move reflecting a sort of diplomatic shift between Israel and United States? FALK: It’s so hard to tell, Jessica. It could be. And some are interpreting it in that way. It could also be nothing more than some kind of technical approval process that has sometimes complicated the relationship between the White House and the Pentagon on these kinds of sensitive arms sales. There was another related development, which was the fact that the Pentagon, without consulting the White House, sent a lot of munitions and weapons to Israel in the midst of the attack, which sorted involved, implicated the United States in Israel’s policies as a country that is potentially complicit with the attack itself. DESVARIEUX: Alright. Richard Falk, joining us from Turkey. FALK: I’m glad to have had the opportunity. Thank you so much, Jessica. DESVARIEUX: And in part two of our conversation, we’ll have Richard on to discuss further the United Nations, what’s next for negotiations. And please stay tuned for that second part. And thank you for joining us on The Real News Network.